E-mail subscribers: this particular article is probably best viewed online in the blog itself, rather than in the e-mail message, due to all of the videos. Earthquakes frequently make cabinet doors swing open and knock out everything in the cabinets, creating a massive mess in the best case, and serious damage or injury in the worst case. Consider not only the breakable dishes and glasses in those cabinets, but also all the different kinds of oils and vinegars and liqueurs and condiments and sauces and bottled-that and jars-of-this that could tumble out and smash onto the floor… well, I suppose a revolutionary new culinary combination taste sensation could come out of it (or, if the earthquake is well-timed with an electrical storm, perhaps a new life form), but it’s generally a good situation to avoid. Having quake-resistant cabinet latches, especially in the high cabinets of a kitchen, is a really good idea. There are several different kinds of products that call themselves quake resistant latches. I’ve long been a big proponent of push latches (touch latches) and have used them for about 25 years now in multiple apartments and condos. These are the latches that prevent your cabinet doors from opening unless the door is pushed in first to make them disengage, and then they re-engage when the door is pushed in again to close. 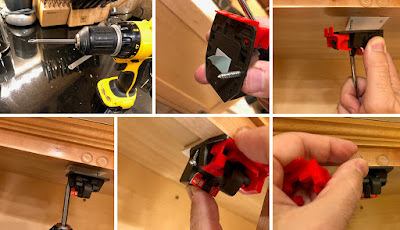 I wrote a long article about tips and tricks for installing these latches in 2012 and for a while, it was the most widely viewed post on this blog. However, the question has been raised occasionally about whether an earthquake could shake the door just right so that it jiggles inward and disengages itself, defeating the whole purpose of having the latch. I’ve felt this was unlikely, and anecdotally have heard that push latches do well in quakes. However, I have recently learned about evidence that these latches can open under the right conditions, and have also been made aware of a different kind of latch that I want to tell you about: the “Murakoshi Perfect Lock PFR-TSAα: Earthquake-proof latch for hinged doors” from Japan (referred to below as the Murakoshi latch). - The Illinois company that is exploring marketing and distributing these latches in the US, Tuson Corporation, which also deals in RV braking safety technology as well as manufacturing for various industries, contacted me initially to get my opinion about the potential US market. They supplied me with some complimentary test samples to try out that I was free to keep and use. Other than these test samples, I have not been compensated in any way to evaluate these latches, the company has known from the start that I would write an honest assessment even if negative, and when I decided to get more of their latches, I purchased them at full price. - Based on my experience with different latches, I volunteered as a favor to review an early draft of their English translation instructions and made suggestions from the standpoint of someone who would try to follow them and install the latches. - Unlike my decades of experience with push latches, I have only used these Murakoshi latches for a few months and therefore can’t advise from personal experience that they will work in a quake or will not freeze up with normal use. However, I am told by Tuson that these latches have been used in Japan successfully for a couple of decades (I have not attempted to independently verify that claim) and that they are on their third generation of latches. - Some of my conclusions of how push latches and Murakoshi latches compare are based on seeing videos provided by Murakoshi itself. However, I found the videos to be pretty convincing. I also want to discourage a subsequent wave of companies asking me to review their products, since I don’t have time to open myself up to that. However, in this case, Murakoshi’s approach was intriguing and I feel that the information I have learned about these latches is well worth passing along. I don't like latches that are always closed and you have to push something out of the way every time you open the cabinet, like the typical child-proof cabinet latches; too much interference in everyday use of your kitchen. I also don't like latches that engage when they sense shaking from a quake, because if some mechanism in the latch has to fall due to the quake, the door could have already opened. I tried the “Shocklock” many years ago and I had to shake it violently for it to finally activate after many seconds. Similar products have been marketed subsequently by some well-regarded seismic bracing companies and I admit I have not tried those latches, but in general, I feel it is a weak concept that success hinges (pun intended) on something in the latch that has to move before the door moves. I do like the push latches, other than the potential for them opening as described here, as the extra pushing motion is really not inconvenient and is even nice because the door than springs toward you as it opens. One concern is that if your guests try to open your cabinet without realizing it has a push latch, they can potentially damage the latch or themselves! When Tuson contacted me and described the Murakoshi latch, I was initially prepared to dismiss it as just another motion-activated latch. However, they have a really neat reverse twist on the concept: this latch is always in the position to prevent the door from opening but it moves out of the way when the door opens. However, a little pendulum mechanism inside the latch has to be centered to allow this, and any displacement of the pendulum prevents the latch from moving out of the way when the door opens. Sounds hard to picture but it works quite well (look at the videos a few paragraphs down). This means that nothing has to move into a lock position before the door opens. When the shaking stops and the pendulum rests in the middle again, the latch can open again; unless something has fallen and is pushing the door from the inside, in which case it doesn’t release until you push the door back inward. Ingenious. And it works. These latches do have a few disadvantages. First, they are expensive. Mine were $12.50 per latch (they are sold in pairs); about double the cost of push latches, which adds up if you are outfitting an entire kitchen. Second, they can only be installed in certain cabinet configurations (more on that later). Third, they are, to put it simply, a pain to install. Even after having installed quite a few of them now, I still find the process to be a mini-ordeal and prefer to not attempt to install more than two of them in one session. 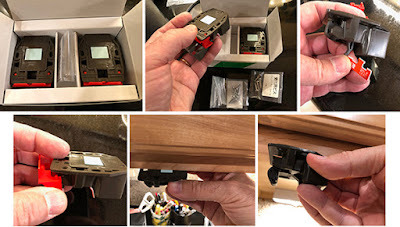 However, this article will take a similar approach to my previous article about push latches: tips and tricks for installation and descriptions of how I dealt with some unusual situations. Do push latches really open up in earthquakes? cabinet; note the "tenting out" of the cabinet doors (click to enlarge image). Oh, did you notice in the video that my plant pot is stuck down?? I think having push latches is far better than having non-quake-resistant latches, and I think under most circumstances, they would not open in a quake. As I said in a reply to someone’s comment at the end of my push latches article, I think the angle and motion of the shaking would make it difficult to open the latches because the latch end and the hinge end of the door, along with the rest of the cabinet, would be moving simultaneously, rather than having the latch end pushed in with a radial motion around the hinge. It's difficult to model this with a cabinet built into the wall. However, I have a free-standing cabinet (usually braced to a wall stud) in which I had installed these latches, with a double door and latch on each door. I tried shaking the cabinet back and forth in the direction perpendicular to the wall, with various forces and magnitudes and frequencies (kind of like my “armquakes” to test Command Strips for picture hanging). For what it's worth, these doors did not budge; you can see the video below (or online directly). The accompanying figure shows the latches on the middle shelf and you can see the doors “tenting” out a bit. That doesn't mean that someone's cabinet won't open up, if given the perfect motion for that cabinet, and much could depend on the particular door and its width, but it doesn't appear that the doors tend to unlatch from general shaking in that direction. CAN push latches really open up in earthquake? Another caveat here: I can’t discount the possibility that the simulations and latch installations were optimized to encourage push latch failure and Murakoshi latch success. However, I believe that the several push latch videos I saw do indicate that they CAN open, and that Murakoshi latches held under these rather violent circumstances. One thing that occurred to me while watching these push latch videos is that the chances of these jiggling open are increased if there is relatively little resistance to the “push” motion to open the latch, and relatively short distance to travel from the starting position to the push-in position. As I discussed in my push latches article, cabinet doors that use push latches can’t rest in the most fully closed position because then there would be no more room to push in to open them, so they have to stick out a little, which has aesthetic disadvantages for double-doors because of the “tenting” look. However, in these Murakoshi videos, I see that the push latch cabinet door did not have to move very far to reach the push-in disengagement position. Minimizing the distance with push latches makes them look the most normal so people might intentionally strive for that situation. However, perhaps the best way to install push latches is to have a healthy distance (like in my figure above), therefore having a greater resistance to push in, reducing the chances that parallel jiggling of door and cabinet in a quake could reach the opening position. So, I think the push latches will prevent the doors from opening in most quakes, especially if you give the door a little extra distance between its resting and opening positions, and I suspect that they will open in some quakes under the right circumstances; but it’s still far better to have push latches than to not have quake resistant latches at all. 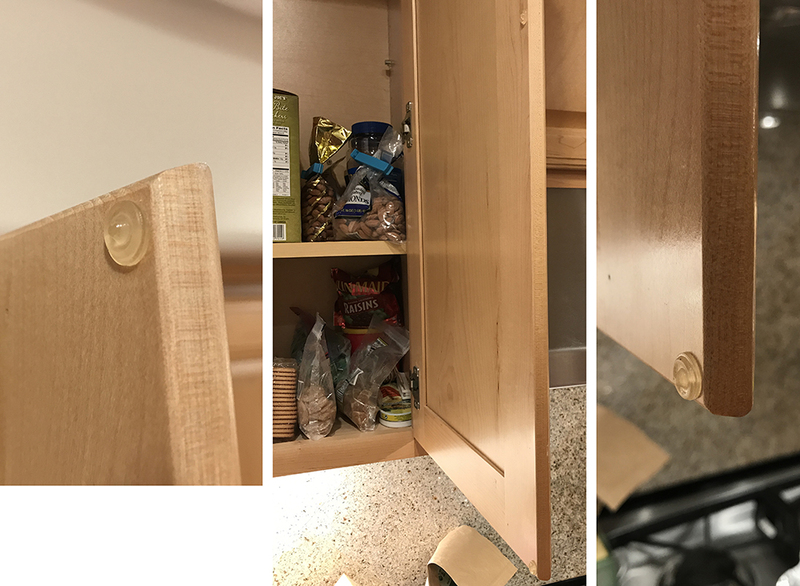 If I had a kitchen full of push latches, I’m not sure I would actually replace them all with the Murakoshi latches, but I might adjust their positions to make the cabinet doors stick out a little more. So how about those Murakoshi latches? However, while I DID have a kitchen full of push latches, Tuson contacted me a few months before I was already planning to move to another home in which the cabinets had no latches at all, so this was a great opportunity to test the new ones and consider installing them instead of push latches. I now have them on most of my upper kitchen cabinets, and what follows is a guide to how I have determined is the best way to install them, including a few extra steps to deal with a non-optimal situation in which the cabinet has a slight step down from its ceiling to the top of the frame (hard to describe; see photographs). First, here’s what the latches look like when installed. 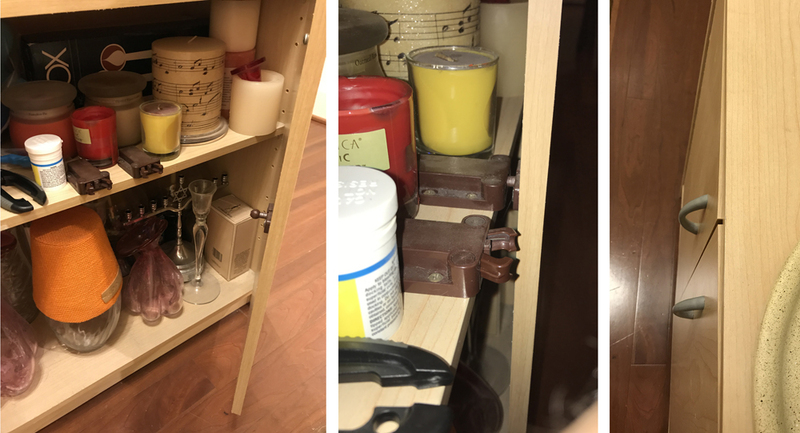 Two issues are already evident in these photos: first, as with the push latches, the only brown latch color available is much darker than the blonde wood cabinets and I really wish that manufacturers of plastic cabinet latches would offer a version that better matches this popular cabinet color. Second, you can see that step down that I mentioned a few sentences ago; these latches are designed to go on a FLAT cabinet ceiling but I was able to add an extra step to the installation to flatten out that step-down with thin pieces of wood or synthetic material (I needed to use slightly longer screws for the back of the latch to compensate for the extra material). This is similar to my approach a couple of homes ago with the push latches in the last figure panel of my push latches article. How do the latches work? I took the liberty of dissecting one of the latches because I think it’s difficult to believe that the concept works until you see it with your own eyes. The three videos are below and I am also including links to the larger versions online (again, you will have the best results by clicking on the following links and watching the high resolution videos on full screen). In this first video (with audio), I have popped the top off and I’m showing you how the guts work. In the second video (with audio), I’ve re-assembled it and I am demonstrating how the latch works while in my hand, not installed. In the third video (no audio in this one), you can see how the latch works after it’s been installed. Note that the catch on the door is supposed to freely slide up and down to ensure that the latch and the catch will fit together perfectly; the catch gets pushed into the correct vertical position when it first meets the latch. I’m making the installation instructions available here as a pdf, the instruction sheet that came with most of my latches. Haha, guess what, it’s in Japanese! If you end up obtaining these latches from Tuson, you will probably have to specify that you want the English instructions, which came with the first latches they sent me and which are available here. Now, I did review an earlier version of the English instructions to make suggestions, but I have to say, even the current version is a bit difficult to follow because the process is a bit complex, so I’ve laid out a step-by-step procedure here based on photos taken while I installed one of the latches. You’ll probably find yourself removing the contents of the top shelf and then removing the shelf itself, so allow room for the power drill. IMPORTANT: if you have never done this before, start with double door cabinets because if you screw up one and can’t open it for some reason, you’ll still be able to access the latch from the other open door. This also gives you the opportunity to look at how the latches are closing by sticking your head into the other open door, as in the video above. Silicone bumper dots push the cabinet door farther away. NOTE: There are two extra steps in my procedure that you might not need to worry about. The first is the addition of the extra flat pieces of material that I used to fill in that upper step-down that I mentioned before. 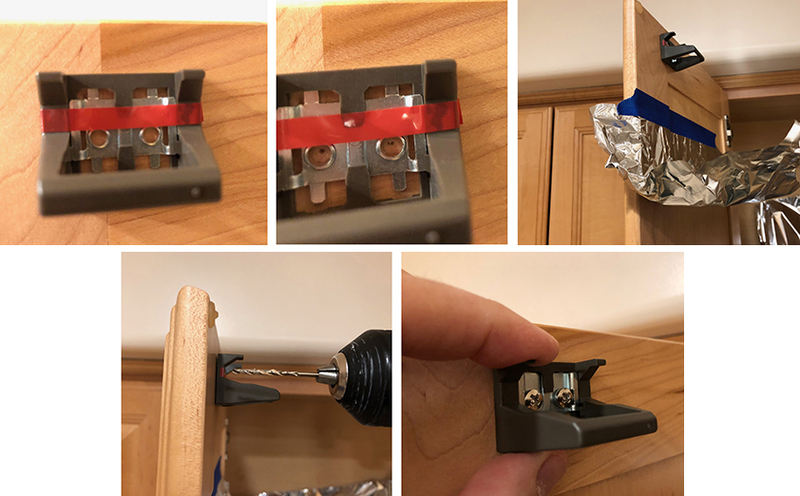 The second is that if you have bumper dots on your cabinet doors like I do, to cushion the closing of the doors and cut down on the slamming sound, they keep the door further away from the cabinet frame and you need to install the latches slightly farther forward so that they reach the catches on the doors. Fortunately, there’s an easy trick to do that as you’ll see below. 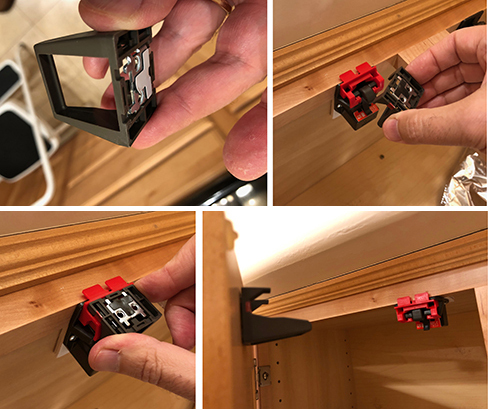 Step 1, test the latch: Take each latch individually and before you install it, temporarily remove the two red protective pieces and confirm by hand that the hook part does not move when you jostle the latch, and that afterward, you can get it to move again by holding it perfectly still against the bottom of a cabinet. Yep, I really do recommend this, for EVERY latch, because (especially in a single door cabinet) if you close the door and the latch does not open even when stationary, the cabinet could be stuck in the closed position! Out of the original 6 latches I was sent to test, one of them actually would not reliably let me open it again (in my hand) after jostling; in fact, that’s the one I dissected because I was already attempting to fix it and popped the cover off in the process. In the batch that I purchased afterwards, I’ve installed 9 more latches so far and none of them have exhibited this problem. Murakoshi says this problem should not occur and mine might have been a rare fluke, but knowing that such a defect (or perhaps damage in transit) is possible, play it safe and test the latches first. Step 1, testing each latch. Click to enlarge image. Step 2 (optional, only necessary if there is a step down from the cabinet ceiling), fill the gap: Determine PRECISELY how thick a flat piece of wood or some other material you need to fill the gap. I had a very hard flat foam board that I had cannibalized a couple of years ago from the bottom of some old luggage; I also have some flat lightweight wood planks coincidentally of the same thickness. My step is about 7 mm deep and two of these planks together are almost 7 mm. I found that if I used double stick tape to make a two-layer piece and then put 4 more layers of double stick tape on the top, I could stick the whole thing to the ceiling of the cabinet with that tape and it was perfectly flush with the cabinet frame; the extra layers of double stick tape let me get an exactly flush mount that is necessary to avoid torqueing the latch when the screws are tightened. For these rear holes only, because of the extra material in the step, for Step 6 I used my own 3/4” flat-Phillips-head #6 screws instead of the 0.55” flat-Phillips-head #6 screws supplied with the latches. Step 3, position the latch: Make a mark on the wood where you want the latch to start. 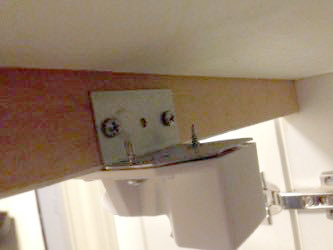 Step 4, mark position of rear holes: (If you have the ceiling step-down, stick your extra layer to the ceiling of the cabinet with the double stick tape.) Hold the latch with its red plastic jig in place up against the cabinet ceiling (I do NOT expose the little built-in tape piece on top of the latch yet), pushing toward the back of the cabinet until the front tabs of the red plastic jig press against the front of the frame, and use a pencil to trace the oval rear holes on the ceiling or the extra layer, depending on your situation. Remove the latch. It’s important to press both red tabs against the frame firmly as you mark the holes so that you don’t end up with a skewed latch. STEP 4 ALTERNATIVE IF YOU HAVE BUMPER DOTS: Before you hold the latch up to make those marks, put some spare bumper dots of similar thickness to those already on your door right behind the tabs of the red plastic jig and press the tabs against those dots, rather than the bare cabinet frame, as in the figure. This ensures that your latch will be forward enough to clear the real dots and connect with the door catch. I have 4 bumper dots that I just keep putting up and taking off as I install a series of latches. Steps 3 and 4, positioning latch. Click to enlarge image. Step 5, drill rear holes: Use a sharp pointed tool like an awl to punch a dimple into the very center of each oval. Then drill a pilot hole up into the frame. (The instructions say to tape the latch in place and then drill with the bit going through the oval hole, but I found that very difficult and prone to causing the latch to move and be attached unevenly.) I found it best to use a drill bit that is slightly on the large side for what you might normally use for the #6 screws that they supply or their equivalents, large enough to let the screws be tightened without too much difficulty; i.e., 3/32” rather than the 1/16” suggested by the back of my box of #6 screws. I usually lay some aluminum foil over whatever is below to catch sawdust. Step 5, drilling rear holes. Click to enlarge image. Step 6, installation of rear screws. Click to enlarge image. Step 6, install rear screws: Here’s where my advice and Murakoshi’s instructions differ considerably: You already put the rear holes in exactly the right place before attaching the latch, so now you can screw in the rear screws. However, still remove the cover of the built-in sticky tape to limit the latch’s ability to twist around as the screws are being tightened, which caused some frustration in my first few installations. Screw both rear screws in while keeping the latch firmly pressed in position because there is play in the rear holes. (I have not found the ability to slide the latch back and forth at this stage to be advantageous.) Then you can remove any temporary spacer bumper dots or you can leave them until the next step. A power screwdriver will make this job MUCH easier, but they tend to be bulky, so invest in an extended Phillips screwdriver attachment so that you aren’t limited to that stumpy short one that probably came with your tool. Step 7, positioning the catch. Click to enlarge image. Step 7, position catch: If you have removed the red plastic jig, snap it back in its position in the latch. (The red and white cardboard insert should still be in place.) 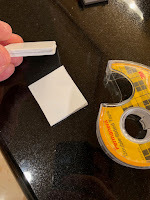 Peel off the white backing of the sticky black tape on the back of the catch and insert the catch into the holes in the latch. Make sure the catch is resting in its ideal position and gently close the cabinet door, press closed for a few seconds, and gently open it The catch should remain stuck to the cabinet door as it opens, in the correct position. It’s nearly impossible to pull that white backing off; I’ve reported this to Tuson and suggested that Murakoshi include a little overhang; we’ll see. Step 8, drill and screw in catch: The catch has a thin red tape that prevents the moving part from sliding at this point; leave it on. Punch guide holes exactly in the center of the metal holes where the screws will go and then drill into the door with the catch in place. Screw in the supplied catch screws and then pull the red tape off, enabling the catch to slide up and down. This requires some dexterity and the picture makes the danger quite obvious: don’t drill through the door! Step 8, positioning the catch. Click image to enlarge. Step 9, installation of front screws. Click to enlarge image. Step 9, install front screws: Now you finally get to take off the red plastic jig and the red & white cardboard tag! Punch guide holes in the center of the front metal holes and drill up into the wood, and then screw in the supplied front screws whether or not you used the supplied rear screws. Tighten securely but don’t over-tighten, and make sure you aren’t torqueing the plastic of the latch. Close the door; you may need to slide the catch around to get it to go into its home position rather than banging into the front of the latch, but once it is close enough to that position, it will take the exactly correct position as the door closes. Open and close it a few times to make sure you hear the “thunk” of the latch moving up and down. If you are installing in a double door cabinet, reach in the “other” door to feel the latch as you close the latch’s door and feel the hook moving in and out; and to convince yourself that things are lined up functionally, press on the back piece of the moving hook while that door is closed and make sure you can’t open the door as long as you prevent that piece from moving. You’re done! If you are used to push latches like I was, you may find it unnerving to not hear the click that accompanies the closing and opening of the doors with those latches; that feedback was constantly in the back of my mind telling me that the latch had engaged and disengaged. The lack of the click required a bit of a leap of faith that this new latch will actually work. However, there is that comforting soft “thunk” sound of the Murakoshi latch moving out of the way when the doors open, so there’s still audible feedback that the latch is behaving as expected; it’s just at a different time. It was disconcerting at first but I got used to it pretty quickly. extending the catch with an extra wood spacer. Click to enlarge image. 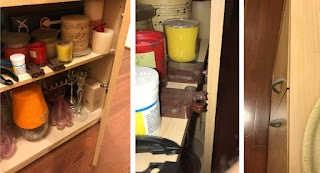 I did encounter one door in which the latch unexpectedly would not work, and upon looking more closely, I realized that this cabinet door was warped so that the top where the latch was actually farther away from the cabinet then the rest of the door. The top bumper dot did not even touch anything. That prevented the latch from being fully closed to the point that the hook would be far enough down to stop the catch from opening. You can kind of see it in these photos; when closed, the top of the door is a little more open than the bottom, and when you look at the open door straight on the edge, you can see a little of the inside of the door at the top but not at the bottom. This was enough warp to cost those precious few millimeters at the top. My solution is shown in the last photo; it works quite well. Not shown, I also replaced the bottom bumper dot with a felt dot to bring the whole door slightly closer to the frame. Interesting concept. Can't seem to find these for sale, however, can you help? Thanks. Right, they aren't easily findable in the US market yet, as mentioned at the end of the article. There's some info there about a contact person for Tuson that I provided, not as an advertisement, but just because I wouldn't want to tell people all about something they can't actually get. I advise contacting her directly, and hopefully they get these on Amazon or some other system easily accessible to the global market.